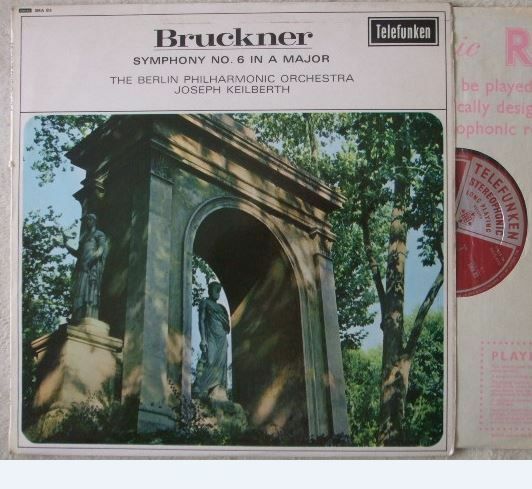 33rpm LP Record of SMA 83 Bruckner SYMPHONY NO 6 in A major, featuring the Berlin Philharmonic Orchestra conducted by Joseph Keilberth. It was issued on the Stereo Telefunken red and silver first grooved label in 1963. UK pressing. 1L/1L matrices. The record itself is graded at least excellent, with no visible marks when viewed under normal domestic lighting. Superb sound quality, with NO jumps, ticks, or crackle and just a very occasional light dust pop. Otherwise more or less faultless playback. Minimal to no spindle wear. Labels very clean, some spider marks, particularly on Side One. The outer flipback sleeve is graded a strong very good, some light wear (rubbing to edges, bumping to corners, faint ringwear). The pinched spine is intact and pretty strong, with a tiny fingernail split a third of the way down, but there is no loss to the lettering. The inner sleeve has no wear to speak of.